With a vision to create a family owned and operated enterprise, we set out in the early 1970's to make wood products from natural hardwoods. Initially we made cider presses for home and small scale orchard use. From there our designs evolved into butcher-block kitchen furniture and Adiron-dack-style porch furniture, items that were functional and affordable for baby-boomers as they furnished their first homes. During our many periods of growth, we have changed from a one-man operation in an old garage in East Corinth, Vermont, to a state-of-the-art manufacturing facility located on the banks of the Connecticut River in Bradford, Vermont. Using a combination of leading-edge computer technology and traditional craftsman techniques, we have created an enterprise that is embedded in our local community, a place that provides a fulfilling work environment for the men and women who come to work here every day. The continued evolution of our furniture designs has coincided with a resurgence of appreciation for designs from the Arts and Crafts, Mission, Shaker, and Scandanavian movements. Today, our aesthetic continues to be strongly influenced by these creative movements, as well as the surroundings here in Vermont. Vermont's Culture has historically placed a high value on preservation as witnessed in the many small villages dotted with architectural gems in the form of houses, libraries, and churches. These understated, well-designed structures inform our creative sensibilities each and every day. Our furniure is best characterized as transitional, neither strictly contemporary nor traditional but rather a combination of elements that incorporate classic proportion and modern simplicity. The Moduluxe Two Door Three Drawer Dresser, by Copeland Furniture. Crafted in solid wood, select from either walnut, maple, or cherry. The dresser features a recessed plinth base for sound footing and a clean contemporary look. One adjustable shelf behind the doors on either side of the cabinet, and drawer glides are full extension and soft closing. The drawer case is crafted from solid hardwood and features dovetail joinery seams. 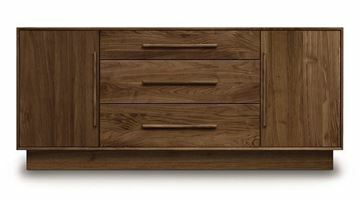 The Moduluxe Right Drawers Dresser, by Copeland Furniture. Crafted in solid wood, select from either walnut, maple, or cherry. The dresser features a recessed plinth base for sound footing and a clean contemporary look. One adjustable shelf behind the door side of the cabinet, and drawer glides are full extension and soft closing. The drawer case is crafted from solid hardwood and features dovetail joinery seams. The Moduluxe Left Drawers Dresser, by Copeland Furniture. Crafted in solid wood, select from either walnut, maple, or cherry. The dresser features a recessed plinth base for sound footing and a clean contemporary look. One adjustable shelf is behind the door side of the cabinet. Drawer glides are full extension and soft closing. The drawer case is crafted from solid hardwood and features dovetail joinery seams. The Moduluxe Tall Chest of Drawers, by Copeland Furniture. Featuring symmetrical and clean balanced lines, finished atop a recessed plinth base design. Crafted in solid wood, select from either walnut, maple, or cherry. Drawer glides are full extension and soft closing. The drawer case is crafted from solid hardwood and features dovetail joinery seams. The Moduluxe Two Drawer Nightstand, by Copeland Furniture. Featuring clean balanced lines, and finished atop a recessed plinth base design. Crafted in solid wood, select from either walnut, maple, or cherry. Drawer glides are full extension and soft closing. The drawer case is crafted from solid hardwood and features dovetail joinery seams. Copeland Furniture Moduluxe Solid Walnut Bed. Optional nightstands come in two widths and feature a small cutout just below the nightstand in the back for wires to pass through. Available as a floating platform design, or with a storage bed base. The floating platform design comes with soft lighting fixtures under the sides and foot of the bed, giving your bedroom a soft glow in the evening. You do not need a box spring for your mattress with either version. Crafted in solid walnut. 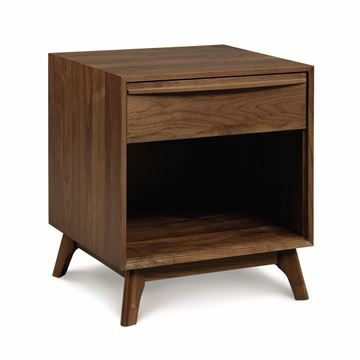 The Catalina Two Drawer Nightstand is a true mid-century modern design, evoking simple lines and elegant form. 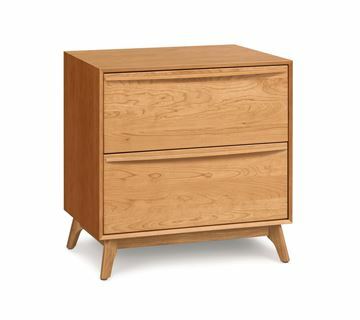 The Nightstand features soft close self close drawers and is available in two heights. The finish is GREENGUARD Certified for low chemical emissions. Crafted in solid Walnut. 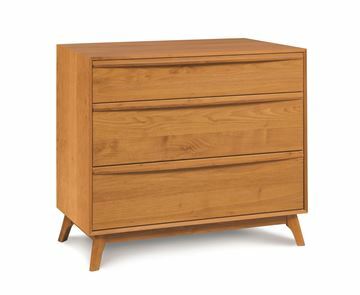 The Catalina One Drawer Nightstand is a true mid-century modern design, evoking simple lines and elegant form. 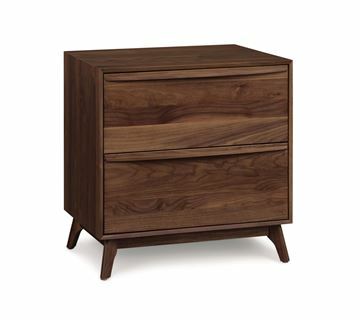 The Nightstand features soft close self close drawers and is available in two heights. The finish is GREENGUARD Certified for low chemical emissions. The Catalina Walnut Eight Drawer Dresser, by Copeland Furniture. 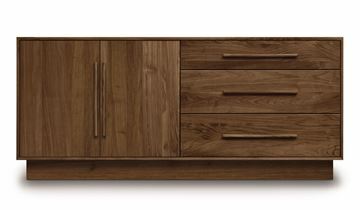 Crafted in solid walnut, the Catalina collection is a balanced mid-century modern design evoking simple lines and elegant form. The finish is GREENGUARD Certified for low chemical emissions. 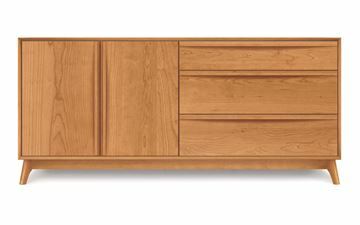 All Catalina dressers and chests feature soft close self close full extension drawer glides. The Catalina Six Drawer Dresser, by Copeland Furniture. Crafted in solid walnut, the Catalina collection is a balanced mid-century modern design evoking simple lines and elegant form. The finish is GREENGUARD Certified for low chemical emissions. 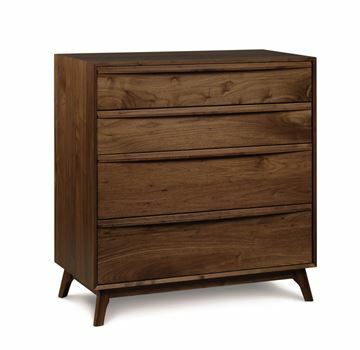 All Catalina dressers and chests feature soft close self close full extension drawer glides. The Catalina Five Drawer Narrow Tall Chest, by Copeland Furniture. 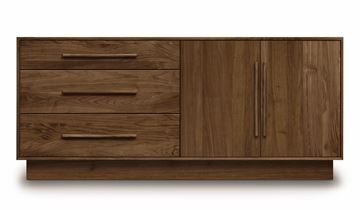 Crafted in solid walnut, the Catalina collection is a balanced mid-century modern design evoking simple lines and elegant form. The finish is GREENGUARD Certified for low chemical emissions. 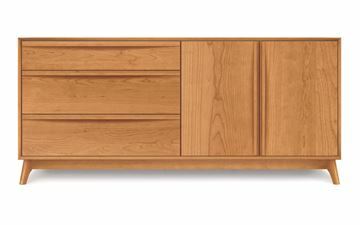 All Catalina dressers and chests feature soft close full extension drawer glides. The Catalina Four Drawer Chest, by Copeland Furniture. Crafted in solid walnut, the Catalina collection is a balanced mid-century modern design evoking simple lines and elegant form. The finish is GREENGUARD Certified for low chemical emissions. 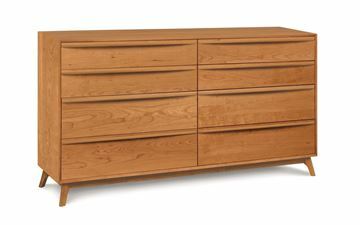 All Catalina dressers and chests feature soft close self close full extension drawer glides. Catalina Solid Walnut Three Drawer Chest by Copeland Furniture. Key design trait is a balanced mid-century modern design, focused on simple lines and elegant form. Drawer boxes are crafted of solid wood, feature dove-tail joinery, and full extension with soft closing drawer glides. Walnut finish is GREENGUARD Certified for low chemical emissions. 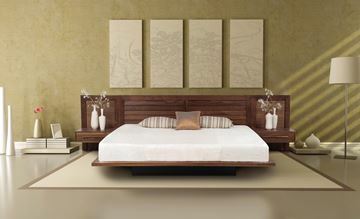 Copeland Furniture Catalina Solid Walnut Bed. A mid-century modern design. Key design trait is simple low and sleek lines, clean profile, and elegant form. Headboard is available in two different heights. Overall design is for a mattress only; no box spring needed. GREENGUARD Certified Finish. The Catalina Dresser with three right drawers and doors on the left side. By Copeland Furniture. A great piece to organize your bedroom. Crafted in solid cherry, the Catalina collection is a balanced mid-century modern design evoking simple lines and elegant form. The finish is GREENGUARD Certified for low chemical emissions. 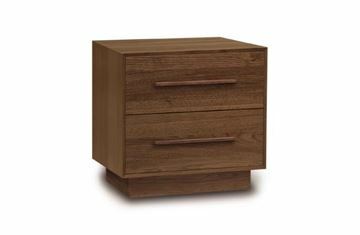 All Catalina dressers and chests feature soft close self close full extension drawer glides. The Catalina Dresser with three left drawers and doors on the right side. By Copeland Furniture. A great piece to organize your bedroom. Crafted in solid cherry, the Catalina collection is a balanced mid-century modern design evoking simple lines and elegant form. The finish is GREENGUARD Certified for low chemical emissions. All Catalina dressers and chests feature soft close self close full extension drawer glides. The Catalina Ten Drawer Dresser, by Copeland Furniture. Crafted in solid cherry, the Catalina collection is a balanced mid-century modern design evoking simple lines and elegant form. The finish is GREENGUARD Certified for low chemical emissions. 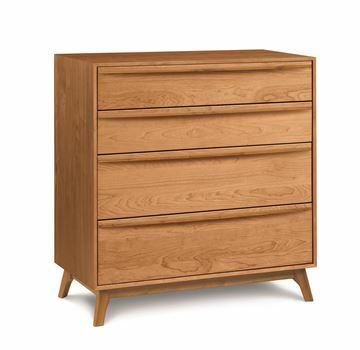 All Catalina dressers and chests feature soft close self close full extension drawer glides. The Catalina Eight Drawer Dresser, by Copeland Furniture. Crafted in solid cherry, the Catalina collection is a balanced mid-century modern design evoking simple lines and elegant form. The finish is GREENGUARD Certified for low chemical emissions. 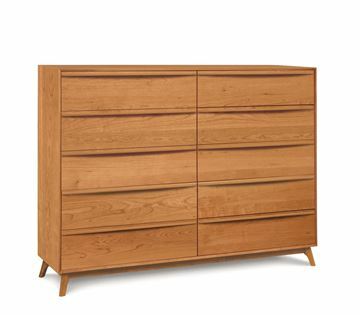 All Catalina dressers and chests feature soft close self close full extension drawer glides. The Catalina Six Drawer Dresser, by Copeland Furniture. Crafted in solid cherry, the Catalina collection is a balanced mid-century modern design evoking simple lines and elegant form. The finish is GREENGUARD Certified for low chemical emissions. 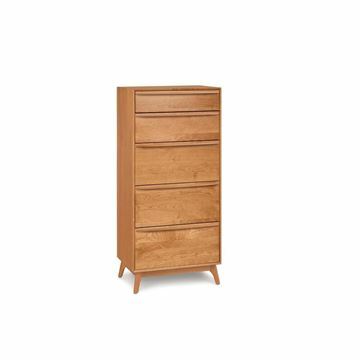 All Catalina dressers and chests feature soft close self close full extension drawer glides. 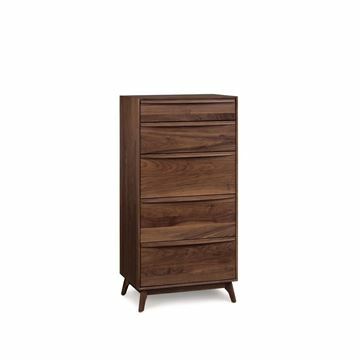 The Catalina Five Drawer Wide Tall Chest, by Copeland Furniture. Crafted in solid cherry, the Catalina collection is a balanced mid-century modern design evoking simple lines and elegant form. The finish is GREENGUARD Certified for low chemical emissions. 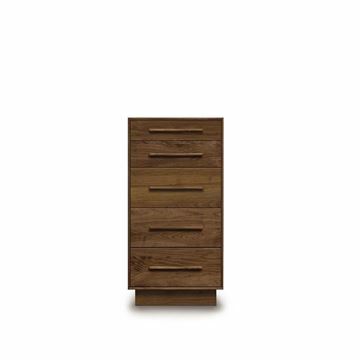 All Catalina dressers and chests feature soft close self close full extension drawer glides. The Catalina Five Drawer Narrow Tall Chest, by Copeland Furniture. Crafted in solid cherry, the Catalina collection is a balanced mid-century modern design evoking simple lines and elegant form. The finish is GREENGUARD Certified for low chemical emissions. 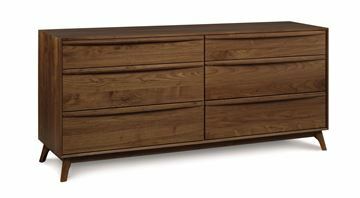 All Catalina dressers and chests feature soft close self close full extension drawer glides. The Catalina Four Drawer Chest, by Copeland Furniture. Crafted in solid cherry, the Catalina collection is a balanced mid-century modern design evoking simple lines and elegant form. The finish is GREENGUARD Certified for low chemical emissions. All Catalina dressers and chests feature soft close self close full extension drawer glides. 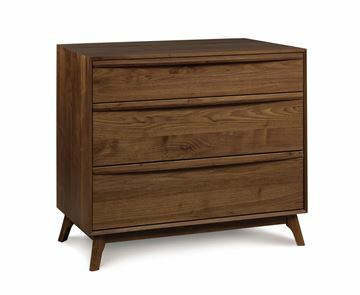 The Catalina Three Drawer Chest, by Copeland Furniture. Crafted in solid cherry, the Catalina collection is a balanced mid-century modern design evoking simple lines and elegant form. The finish is GREENGUARD Certified for low chemical emissions. 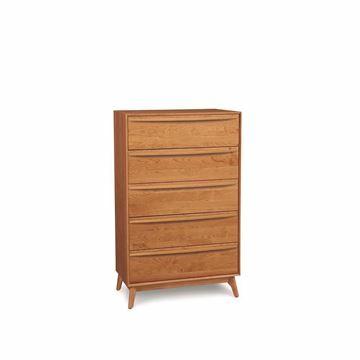 All Catalina dressers and chests feature soft close self close full extension drawer glides. Copeland's Catalina solid cherry bed, a mid-century modern design evoking simple lines and elegant form. The Catalina bed is low and sleek, designed for a mattress only, and is available in two headboard heights. The side rails and foot rail are a very clean slim line design, which creates a light and open feel to the overall design. The finish is GREENGUARD Certified for low chemical emissions. Crafted in solid Cherry. 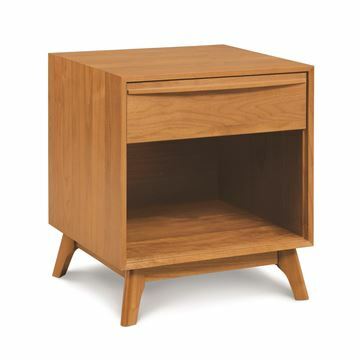 The Catalina Two Drawer Nightstand is a true mid-century modern design, evoking simple lines and elegant form. The Nightstand features soft close self close drawers and is available in two heights. The finish is GREENGUARD Certified for low chemical emissions. Crafted in solid Cherry. 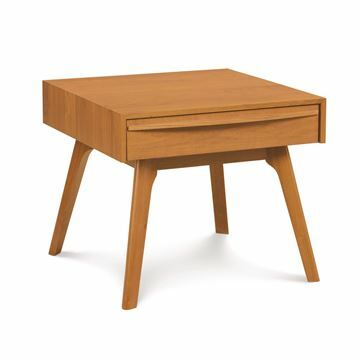 The Catalina One Drawer Nightstand is a true mid-century modern design, evoking simple lines and elegant form. The Nightstand features soft close self close drawers and is available in two heights. The finish is GREENGUARD Certified for low chemical emissions.